The latest version of Apple’s desktop operating system is here at last. So, once you’ve upgraded, what’s new? Apple has lined up over 250 new features for its latest release. Although most of them are pretty minor, here we highlight the major changes and some of the best smaller ones you should be looking out for too. Full-screen apps: Something newcomers to OS X sometimes take a while to adjust to has always been the lack of a full screen mode for apps. Sure, you could manually drag the corner of a window out until it filled as much of the screen as possible, but it wasn’t quite the same. 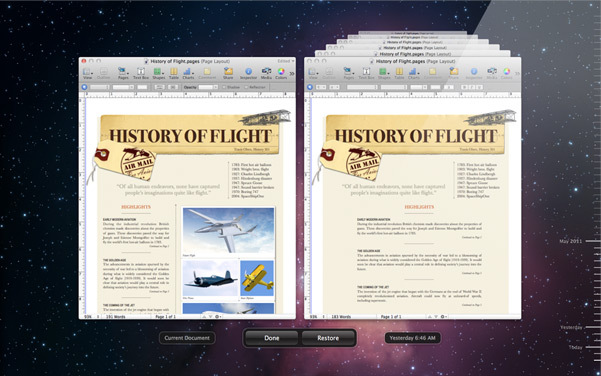 With Lion, apps are allowed to completely fill the screen for the first time. Apps which support full screen mode (this includes all Apple’s apps which come with OS X) feature a small icon in the top right-hand corner to toggle between full-screen mode and a normal window. Meanwhile, a three-finger swipe left or right on your trackpad or Magic Mouse will switch quickly between open full-screen apps and the desktop. In a related new feature, you can now resize windows from any corner, not just their bottom right-hand point. Mission Control: With so much running simultaneously on many computers nowadays, getting a quick overview of it all is important. While previous versions of OS X offered Exposé and Spaces as ways of managing this, Lion introduces Mission Control as a ‘one-stop shop’ for accessing everything running on your computer at any one time. 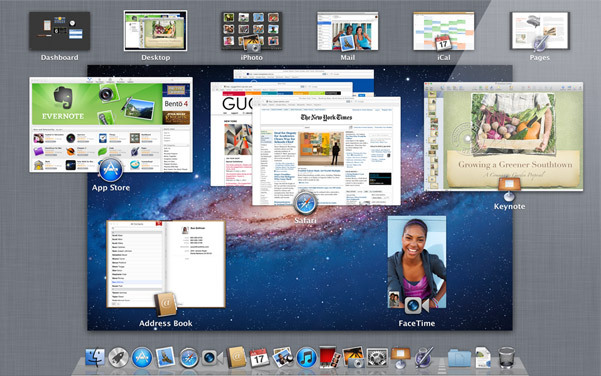 A three-finger swipe up on your trackpad or Magic Mouse brings up the new view (or you can open it from the Dock), which displays all running apps, the Dashboard and the desktop along the top and all open windows neatly displayed below, in a way that lets you switch to anything quickly and easily. Launchpad: Let’s face it, finding and launching apps in OS X hasn’t been as easy as it could be. Unless they were in the Dock, most apps were hidden in away in your Applications folder, meaning they may not have got used as much as they may have done otherwise. Launchpad brings an easily accessible iOS-style app grid to the party. 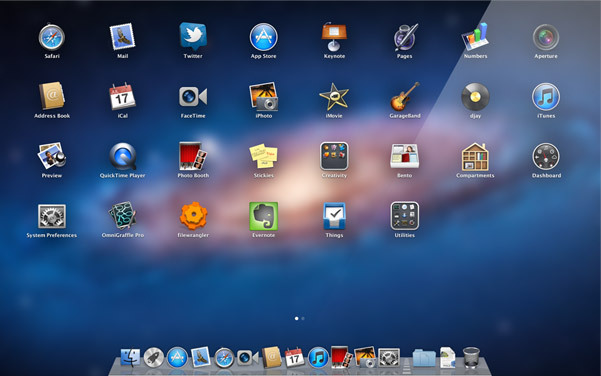 Just move five fingers into the centre of the trackpad or Magic Mouse to bring up the Launchpad or click its Dock icon. 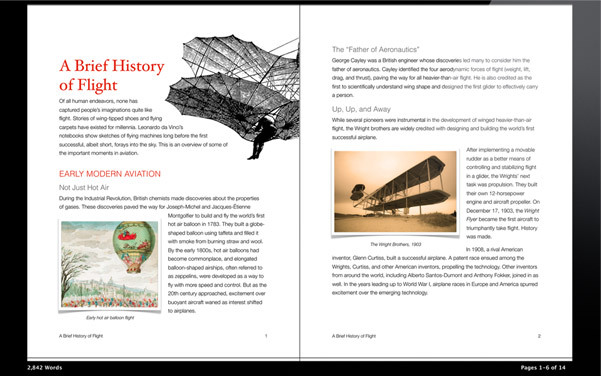 From there, two-finger swipes left and right scroll between the available apps. As with iOS, you can drag apps on top of each other to create folders for easy organisation, and easily delete apps by holding a click on them until an ‘x’ appears next to them, before ditching them from your computer. Apps previously purchased from the Mac App Store can be reinstalled for free if you ever want them back. Apple’s Mail app has taken some heat of late from the rival Sparrow client. 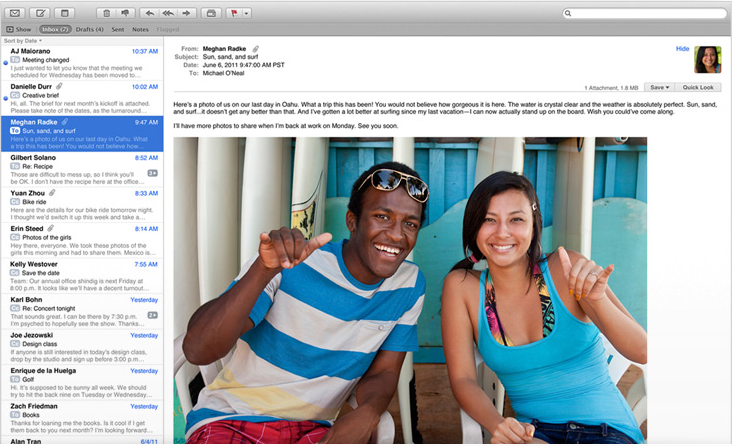 With Lion, the built-in OS X email solution has had a revamp. It now supports full-screen mode, offers a bigger email view and adds features like ‘Favorites’ (for ‘bookmarking’ emails like Gmail’s stars), two-line email previews in the inbox, improved search and a new conversation view, again similar to Gmail’s approach. iCal gets a new look; support for full-screen mode; new day and year views; the ability to quickly add appointments using natural language (“Meet George Smith in the Boozy Newt at 3pm”), and a ‘heat map’ to quickly scan over your upcoming activities. Photo Booth now supports full-screen mode, gets new effects and support for gesture controls. Apple’s Preview app now lets you add your signature to PDF documents. Hold your signature up to your Mac’s built-in camera, and Preview ‘scans’ it, letting you add a digital version to documents with ease. Resume, Auto-save and Versions: Another feature ported from iOS is Resume. This means that your apps are continually saving as you go – no need to manually hit Cmd+S any more. As a result, any app or computer crashes you might suffer should be a lot less painful as everything should resume exactly as it was the second you re-open the app. Additionally, you can easily revert to the state a document was in when it was opened or lock it to prevent any changes from being saved. Meanwhile, ‘Versions’ takes its cue from OS X’s previously existing Time Machine back up feature, letting you ‘go back in time’ in the history of a document to revert to a previous edit. The document edit history is saved with the file, meaning that other people who access the file get your edit history too. Swipe three fingers to the left or right to switch between which full-screen app is visible. Double tap an area of the screen to zoom in on it. Users of iOS will be used to this one. 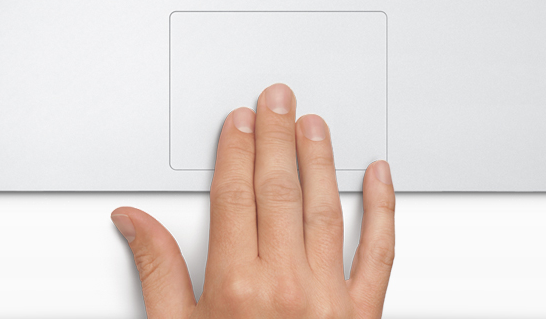 Move five fingers into the centre of the trackpad to open the new Launchpad app launcher. Additionally, gestures from Snow Leopard, such as moving forwards and backwards in the browser, have new animations to make them feel fresher. Changes to scrolling: In OS X Lion, when you scroll or swipe, content on-screen now moves in the same direction as your finger. This has divided the opinion of developers who have been trying pre-released versions of the new OS, annoying some. The good news is that it’s easy to switch back to the traditional way of scrolling from the System Preferences pane. Additionally, the scroll bar at the right-hand side of windows in OS X now disappears when it isn’t being used – a small but noticeable design decision. AirDrop: This is a new, easy way of sending files to other Mac users nearby wirelessly. The feature finds other supported Macs within 30 feet and allows you to offer files to them. If the user at the other end accepts, it’s sent straight to the Downloads folder over an encrypted peer-to-peer connection. A built-in restore partition: Given that MacBook Airs don’t have disc drives, the restore partition will allow you to repair or reinstall the OS without needing a disk. New languages: Arabic, Czech, Turkish, and Hungarian options are supported for the first time. Additionally, twenty new font families for document and web display of text offer support for display of languages like Bengali, Kannada, Malayalam, Oriya, Sinhala, and Telugu. Devanagari, Gujarati, Gurmukhi, Urdu, and Tamil have been expanded. And three new font families support Lao, Khmer, and Myanmar. Vertical text display is added, as used in Japanese and Chinese. The Quick Look file preview in the Finder is improved: It now supports web page links in email, Address Book contacts, and Spotlight results, and showing addresses as Google maps. iOS-style Autocorrect: You can press Return to accept a suggested change or click the ‘x’ to keep your own spelling. There are quite frankly far too many small changes and improvements to OS X Lion for us to list every one here. Apple details more of what’s new on its own site, here.